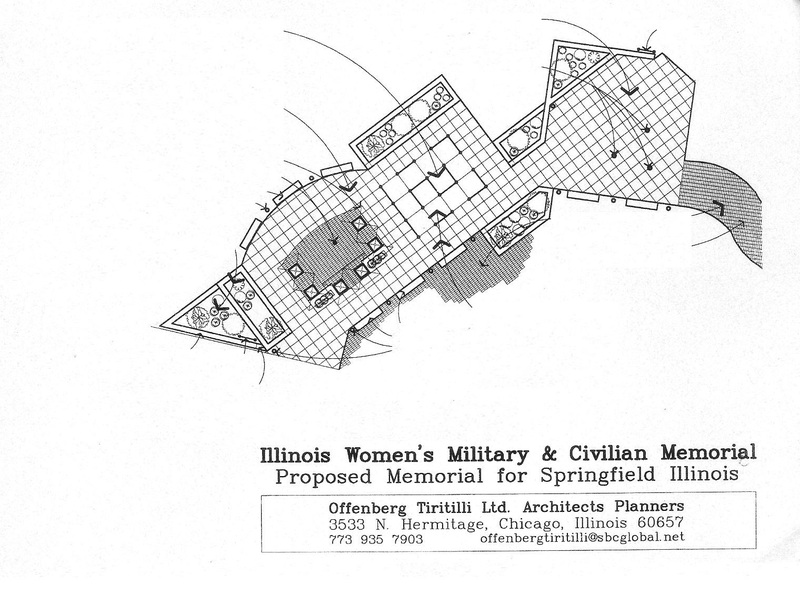 This is a proposed design of the Illinois Women’s Military and Civilian Memorial. The final design will be completed when confirmed by the Illinois Historic Preservation Agency and all requirements are met. The proposed design is by Basil Tiritilli of Offenberg Tiritilli Ltd of Chicago, Illinois. The overall design of the memorial is a History Garden that has panels showcasing the history of Illinois women, both military and civilian, through pictures, stories and poetry. Also, there are plans to be a green memorial, with materials used, design for water collection and solar. The garden is to represent a place of life and renewal with the growth of new plants and flowers each spring. The surrounding trees are evergreen, ash and oak, which represent the support roles and individuality of the women who served. The open areas represent the fact that women were not sheltered from the elements and hazards of the war. There are six planters and on each corner there will be an emblem of a military service branch and a State emblem for the civilian women. Each planter may be planted differently and the edge of the planters will be high enough for seating. All flowers and foliage will be native to Illinois, representing the flowers of our youth, who volunteered from this state to serve our country. This area is to be shared with the proposed Freedom Memorial and both memorials for flag ceremonies. This area will have history panels that will tell the story of service women from all branches of the armed serves and civilian women. The panels will display pictures, stories, and poetry of women who served from the Civil War to present and will be able to add future generations.. The paths through the panels, will represent the old and new paths, that the women of all eras, have forged for generations to come. This area is under an open air pergola, of six columns (the six sisters) representing the five military service branches and civilian women. The columns will serve as rain water harvesting system, to collect water in an underground tank to be pumped for plant watering line. In the center of the pergola there will be a sculptured pole with a replica of the Nightingale lamp, which will contain a flame. It is a symbol of healing to all in the nursing profession, who play an important role especially during the times of war. The light of the flame will burn continuously to call all who need healing, to a place of safe harbor in times of ongoing storms. A sculpture of a dove, will represent peace, home and family. Concrete is scored in 2’ x 2’ or 4’ x 4’ squares. The concrete will be of a porous type to let water flow through to help maintain the water table. Concrete squares could also be stamped with unit insignias. These will be bricks purchased by donors to the memorial, inscribed with a name of donor’s choice. Benches will be placed throughout the memorial area. Also the edges around the planters will be high enough for seating. From these locations you will be able to see the, Vietnam, Korean and World War II memorials. Lighting will be in keeping with the other memorials and plans are to be powered by solar. On the east and west entrances, there will be a plaque with the name Illinois Women’s Military and Civilian Memorial and other necessary information.